Flowering scape or stem 6 to 15 inches high, with two to five (usually three), oval, oblong or obovate, thin, glossy green leaves at the base, their petioles sheathing the base of the stem which arises from a slender root-stock. Leaves ciliate, 5 to 8 inches long, and 1½ to 3½ inches wide. Flowers three to six, forming an umbel at the top of the stem, sometimes a secondary cluster of flowers below the top, drooping, greenish yellow, three-fourths to 1 inch long, on pedicels about as long as the flowers; perianth segments distinct, six in number, equal and somewhat spreading, the six stamens about as long as the perianth. Fruit an oval, dark blue, shining berry about one-fourth of an inch in diameter. In moist woods and thickets, Newfoundland to Manitoba, south to North Carolina and Wisconsin. Very common in the rich, moist woodlands of northern New York, but rare or absent from the coastal region. Flowering from the latter part of May until the last of June. The fruit ripe in September. 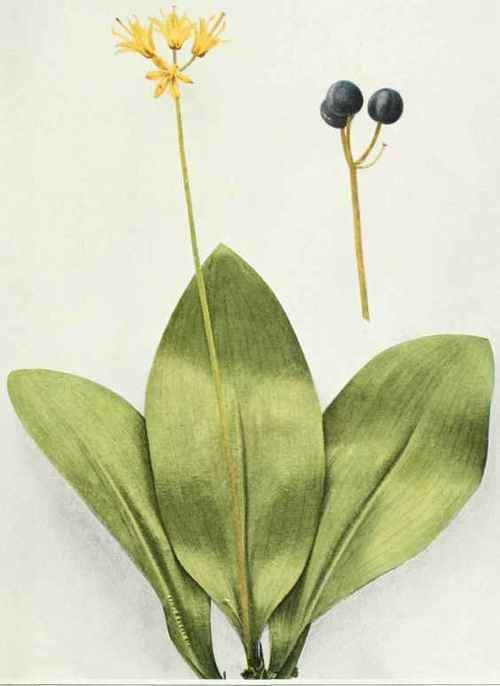 The White Clintonia (Clintonia umbellulata (Michaux) Torrey), with smaller white flowers, not drooping, and black berries, leaves and scapes more pubescent but otherwise similar, which is common in the southern Appalachians, reaches New York in the southwestern counties of the State.